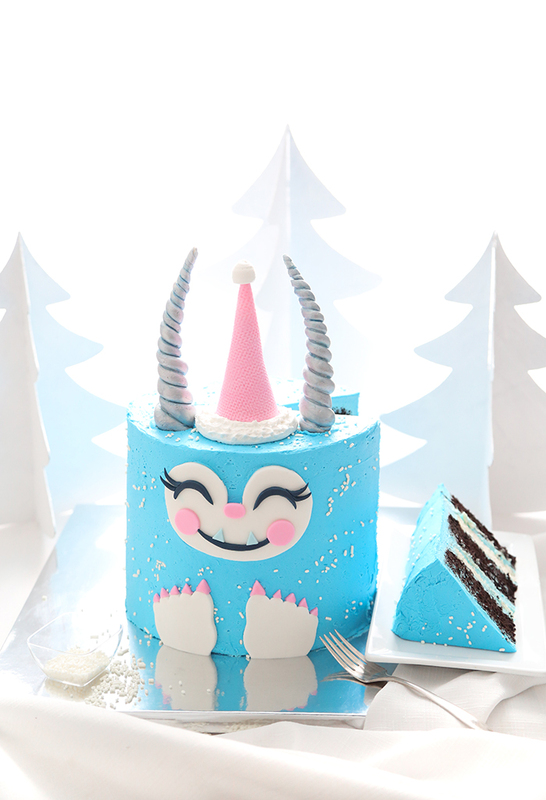 If you're into rich chocolate cake wrapped in wintry folklore with a dash of cute, then this cake is for you! It's a delicious confection made with alternating layers of chocolate cake and cheesecake. 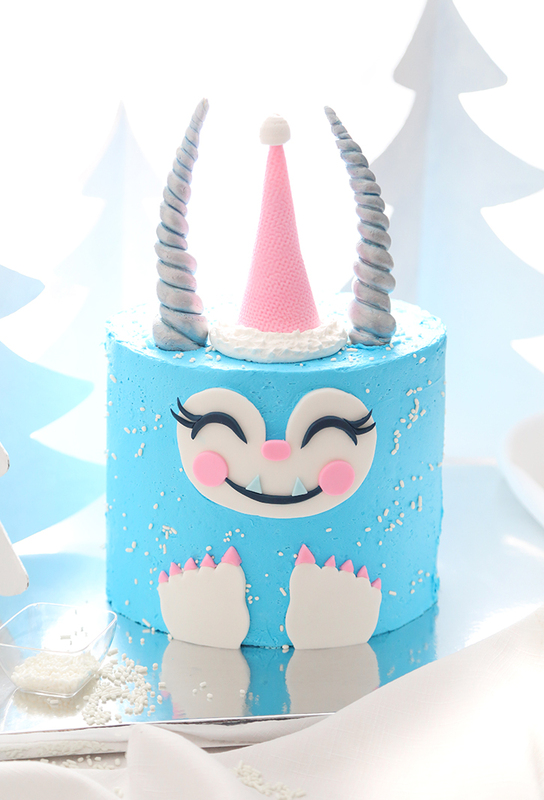 The yeti's coat is made of blue buttercream studded with white sprinkles, and a happy face is created using fondant decors. Altogether complete, she had so much personality we named her 'Jampa' which is a Tibetan name, loosely translated: kindness, caring. In a moment of pure cake-decorating silliness, a decision was made to give her pink toenails. YES, she's a yeti with a pedi. Clearly, this cake was an absolute joy to create, and I hope you love it, too! It's strange the questions you research when making a yeti cake, such as Q: Do yetis have horns? A: Probably. Q: Is yeti singular or plural? A: Both. Q: Do yeti have toe beans? A: They are most likely primates, so no. I decided the yeti cake should have tall, shiny horns, and found that they could be fashioned from long skewers and gum paste. Silver luster dust mixed with clear extract creates silver paint that can be used to paint the horns. Brushing a little blue dust in the creases of the horns will give it dimension, and I really loved the effect! I used my favorite chocolate cake as the base, which is tender beyond words! It's baked at a low temperature (300F) which ensures a soft crumb. To shortcut the work, I used a purchased a New York style cheesecake from a bakery and cut it in half horizontally to make two layers. These are alternated with the chocolate cakes. After frosting, the result is a tall cake with enough surface area to add facial features and a couple of big feet! I've tried my best to describe how to make the face in the recipe instructions, but often in the recipe text you'll find 'see video for visual cues'. The video will help guide you with the facial features, which I think are most difficult to explain. Almost every element from the face was made using this set of nesting circle cutters. I use these so often, I keep them out on my prep table (and I probably should have added them to this year's gift guide!). How funny is it that I already had a FOOT cookie cutter in my collection!? It's from this set of 101 cutters from Wilton. If you don't want to buy 101 cookie cutters, you can find a single foot cutter here. If you don't want to add a foot cookie cutter to your collection AT ALL, you'll find a printable template link for the face piece and feet in the recipe section. If you end up using the cookie cutter, cut the heels off to make the feet shorter before attaching them to the cake. The fangs and toenails are made with star cookie cutters. You'll stamp stars from fondant and cut off the points to make tiny triangles - it's that simple! Just like the circles I mentioned earlier, this set of nesting star cutters will give you all the sizes needed for this project. Possibly the best thing about this cake (besides it being crazy delish!) is that it will serve about 20 party people. Maybe more. It's sure to be the center of attention at your next holiday gathering. Heck, it would even be cute for a January birthday! The pink Santa hat on top was a final touch, and it's easily made with a sugar cone and fondant. You could also dip the cone in pink melted candy if you prefer. Jampa reminds me a bit of Frosty the Snowman, and how in winter he came to life one day. Well, she did too! I think she may have to be our new Christmas cake tradition! For the cakes, preheat oven to 300°F. Grease three 9-inch round pans with shortening. Line bottoms with rounds of parchment paper and grease paper. Finely chop chocolate combine it in a bowl with hot coffee or hot water. Let mixture stand, stirring occasionally, until chocolate is melted and mixture is smooth. Sift together flour, sugar, cocoa powder, baking soda, baking powder, and salt into a large bowl. In another large bowl with an electric mixer beat eggs until thickened slightly and lemon colored (about 3 minutes with a standing mixer or 5 minutes with a hand-held mixer). Add oil, sour cream, vanilla, and melted chocolate mixture to eggs, beating until combined well. Add flour mixture and beat on medium speed until just combined. Divide batter between 3- 9” pans and bake in middle of oven until cake springs back when pressed in the center, approximately 40-50 minutes. Cool layers in pans for 15 minutes on racks. Run a thin knife around edges of pans and invert layers onto wire racks. Carefully remove parchment paper and cool layers completely. Cake layers may be made 1 day ahead and kept, wrapped well in plastic wrap, at room temperature. Make the buttercream: Place the butter in a standing mixer fitted with the whip attachment. Beat on high speed until light and fluffy. Mix in the powdered sugar a little at a time. Add milk or cream to think the icing to spreading consistency. Beat on high speed until the frosting is almost white and very fluffy. Remove 1/3 cup of the white icing to a piping bag with a plain round 1/2-inch tip (or snip a 1/2-inch hole in the tip). 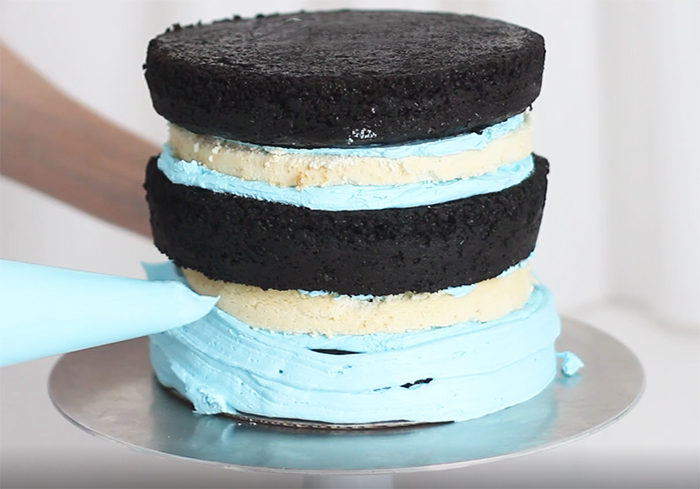 Tint the remaining icing with the sky blue gel food color. Assemble: Cut the cheesecake in half using a cake leveler. Level chocolate cakes in needed. Place one chocolate cake layer on a cake board and lightly frost with buttercream. Add a cheesecake layer; lightly frost. Alternate stacking with cheesecake layer and chocolate layers. 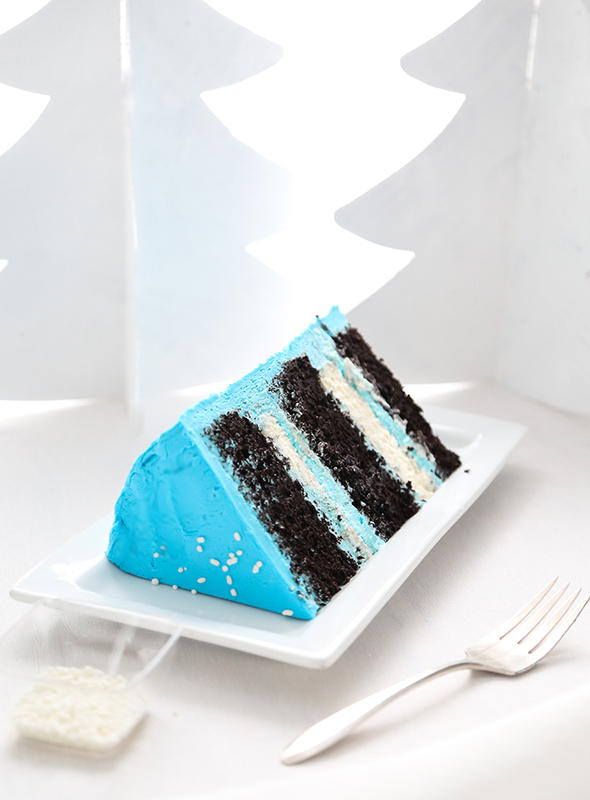 Frost entire cake with a crumb coat of blue icing and refrigerate. 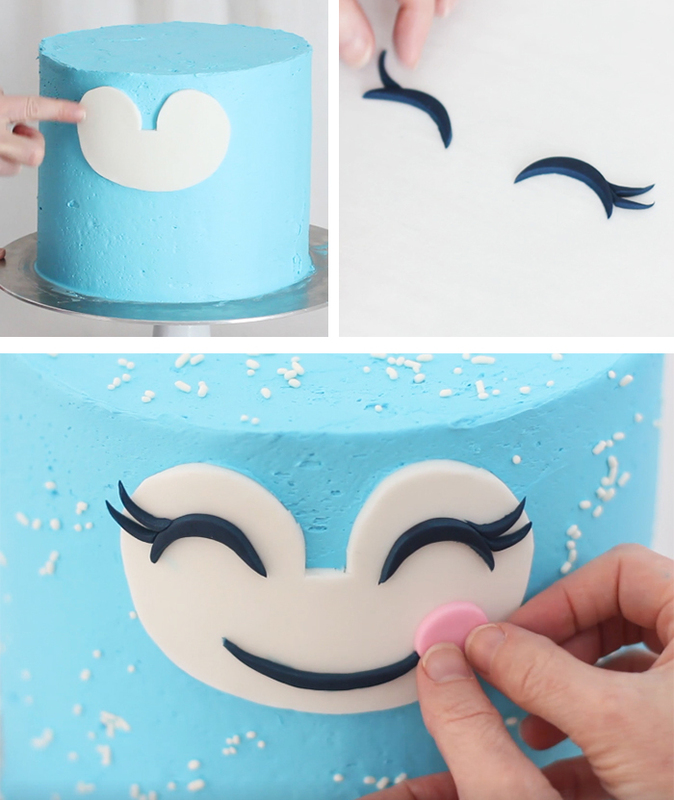 For the face, print the face template and lay on top of a piece of white fondant rolled to 1/8 inch thickness. Cut around the shape through the paper and fondant using an X-acto knife. Remove the shape from the fondant and return the remaining fondant to its container. Frost the cake with a second smooth layer of buttercream and immediately place the face piece toward the upper edge of the cake. Immediately toss white sprinkles onto the cake. Refrigerate the cake until firm. Use a 1-inch star cutter to stamp 2 stars from the pink frosting, and then cut each star point off so that you have 10 tiny triangle pieces. Attach each of these as pink toenails at the end of each toe using buttercream. Knead a small amount of navy blue fondant with white to make light blue fondant. 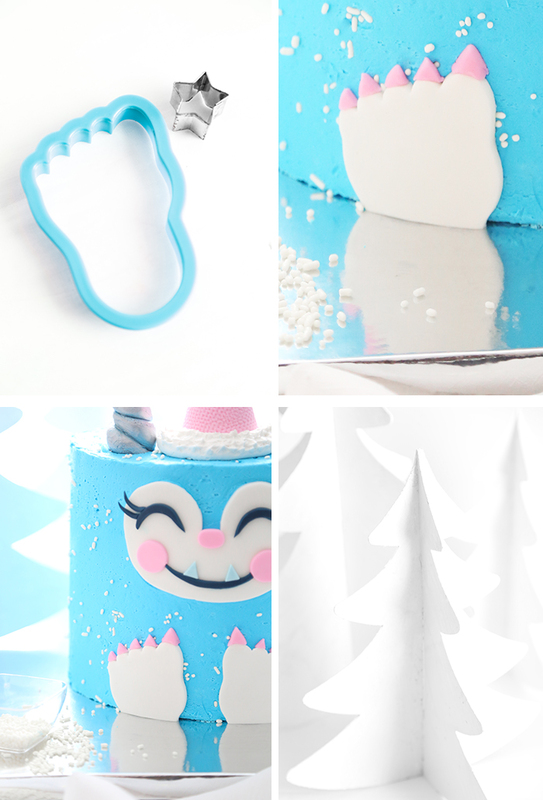 Use the star cutter to cut 1 star from light blue fondant; cut 2 points off for the yeti fangs. Attach them using buttercream. Print the foot template and lay on rolled white fondant. Cut out 2 pieces using an x-acto knife. Attach right foot at the bottom of the cake under the face using a dab of white buttercream. Turn the remaining piece to the opposite side and place on the bottom of the cake so that the big toes are close to one another; attach with buttercream. Attach the pink triangles to the ends of the toes using buttercream. For the horns, bend the wooden skewers slightly so that they curve at one end (be careful not to break them!). Roll four pieces of gum paste into ropes that taper at one end. Place two pieces together and wind them around the bent part of the skewer; add water to adhere them together. Repeat with remaining gum paste pieces. 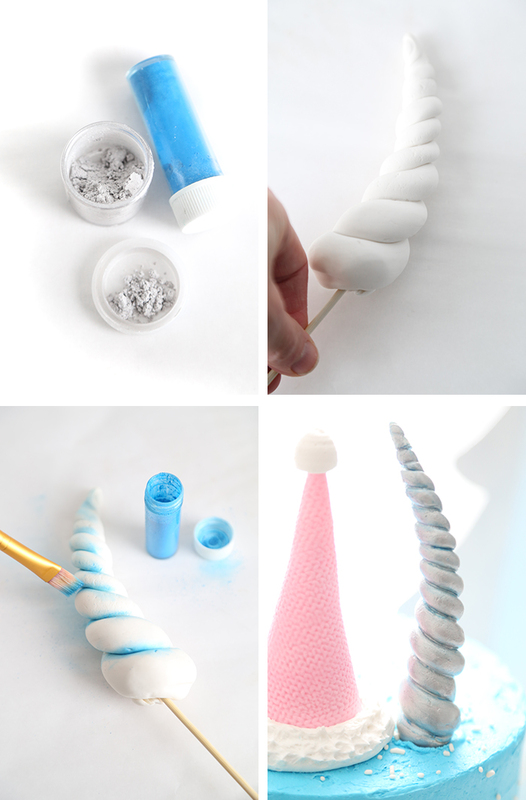 Stand the horns upright into Styrofoam or in a tall heavy drinking glass and allow them to dry until firm. When firm, brush the creases in the horn with blue petal dust. Mix silver luster dust with a little clear extract to create silver paint. Use the paint to cover the horns. Let them stand until dry, about 1 hour. Trim ends of skewers if necessary and insert the horns on top of the cake to the left and right above the face on the front of the cake. Leave room in the center for the sugar cone hat. For the hat, roll a piece of pink fondant large enough to cover the sugar cone. (I used a knit texture mat, and you could too!) Trim away excess fondant and attach it to the cone using dots of corn syrup or buttercream. Pipe a circle of white buttercream on the top of the cake between the horns. Pipe the shape about 1-inch larger than the open base of the sugar cone. Place the fondant-covered cone in the center of the piped buttercream. Use a kitchen dedicated art brush to dab texture onto the white buttercream; pull the buttercream into small peaks all over, giving it a furry look. Pipe a small dot of white buttercream on the tip of the cone. Present cake to delighted holiday party guests. Store leftovers in the refrigerator. This cake was made in the style first made popular by Jenna Rae Cakes' unicorn cake. This must be one of your most adorable creations! I have been reading your blog for over 5 years now, and I keep wondering where you find your inspiration?! Also, because of this article I would loooooooove to see a kitchen tour or kitchen supplies overview. I'm very curious to see how you keep everything organised. Keep on the amazing work! Cake recipe was great I loved it. Blue Blue everywhere I like it.